Our Mission is to prevent or minimize the loss of life, loss of property and damage to the environment from the adverse effects of fire, medical emergencies and natural or manmade disasters. The Brecksville Fire Department is a full time fire department with a staff of full time and part time or volunteer firefighters. Our primary concern and objective is the preservation of life and property. The services that we provide to the community are fire protection and suppression, EMS, Rescue, Public Safety Education, and Fire Prevention. The area of Brecksville that we cover is 19 square miles with a population of just over 13,500 residents. 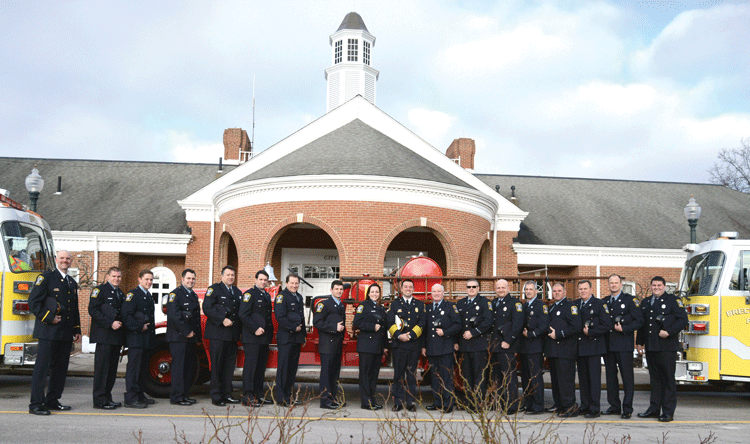 Here at the Brecksville Fire Department we are on duty 24 hours a day, 7 days a week and 365 days a year to serve the needs of our citizens and all who visit the City of Brecksville. The fire department responds to all reported calls of fire or alarms indicating the possibility of fire. The on duty shift responds to all fire related calls and in the event that more man power is needed a call will be put out for all off duty and volunteer firefighters. Mutual aid agreements are also in place with neighboring communities in the event that even more manpower or equipment is needed for the safety of both our residents and our firefighters. We respond with an Advanced Life Support equipped ambulance to all calls of medical emergencies. 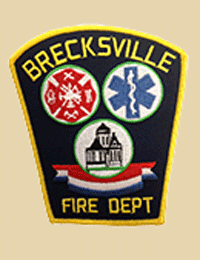 The Brecksville Fire Department has 32 Paramedics and 8 EMTs. Currently the fire department has 3 ambulances. We are under the medical direction of MetroHealth Hospital. We transport to many hospitals and try to accommodate the patient or family’s request to transport to the hospital of their choice. However, the patient’s condition will determine the closest appropriate hospital to be transported. Sometimes we will call for the assistance of Metro Life Flight for support to transport the critically injured or ill patient to the appropriate trauma center. Any calls for the ambulance should be made by calling 911. The members of the Brecksville Fire Department are trained in many different areas of technical rescue and heavy rescue. We have members trained in rope rescue, river, and ice rescue. We also have members trained in confined space rescue, trench rescue, vehicle extrication, and many more specialized areas. The fire department is also a member of the S.E.R.T. team. The S.E.R.T. team is a technical rescue team that is composed of 19 communities in the southwest portion of Cuyahoga County. The S.E.R.T. team has a few members on every department that are all trained in specialized rescue, hazardous materials, and fire investigation. The S.E.R.T. team has over 100 members, and we currently have 8 of our firefighters on the team. The Brecksville Fire Department, in partnership with MetroHealth hospital is offering an in-home fall risk assessment for all residents of the City of Brecksville. This is an assessment of residential living spaces to help identify possible risk factors that may lead to a fall. We then offer recommendations to lower the risk and possibly prevent a fall. On an average year, one out of three elderly adults will experience a fall. Falls are the leading cause of non-fatal and fatal injuries. The Brecksville Fire Department would like to help reduce the risk of this happening to our residents. If you are interested in scheduling an in-home fall risk assessment, please contact Firefighter John Niton by contacting the fire department at 440-526-2640. Appointments can be made Monday through Friday from 9am – 5pm. Trusted by thousands of fire and law enforcement agencies for over 40 years, Knox Rapid Access Solutions have provided first responders with immediate access into secure buildings, campuses, residences and commercial properties when it matters most. Removing barriers to entry reduces injuries to responders and minimizes property damage. That's the power of the Knox rapid access system. The Knox company is no longer using paper order forms starting January 2019 to buy their products. All Knox boxes will be ordered online through their web site, www.Knoxbox.com . If a resident or business owner is interested in purchasing a Knox Box and has questions regarding the operation of them and the correct model to order, please contact Lieutenant Brian Zimlich at the Brecksville Fire Department by calling 440-526-2640.